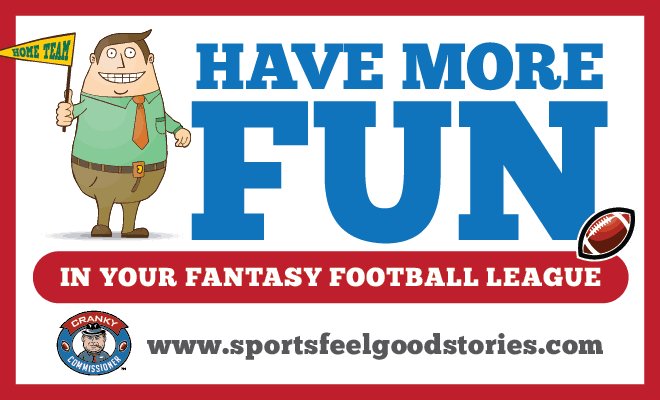 Looking for ways to have more fun in your fantasy football league? 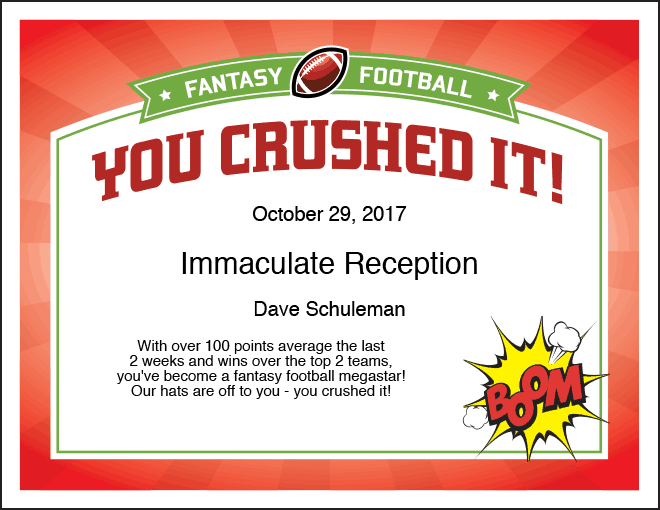 If you’ve ever played fantasy football, you know it can be a lot of fun. First, there’s the preparation for draft night. Never before have you known so much about the third receivers on teams like the Jacksonville Jaguars and Buffalo Bills. You understand the importance of running backs and how Gronk breaks the mold at tight end. You’ve done your research on the best fantasy football teams names and have chosen a winner in “It’s Always Runny in Philadelphia.” You’re ready for the draft and to assemble your team. Then, draft night arrives. You dress the part of a football consigliere, arrive early, talk some great smack, eat way too much pizza, but still manage to have a blast. Fellow owners are questioning picks, ridiculing teams and more. There’s a lot of energy and it’s fun talking football and catching up with old friends, and making some new ones. And, tracking the the games and results is interesting — especially if have a winning fantasy football team. But, then in some leagues, interest can wane. Sure, the commissioner might send out a group email or two, and a high profile trade might spark some conversation, but the excitement diminishes. How do you correct that? We have the solution for you. 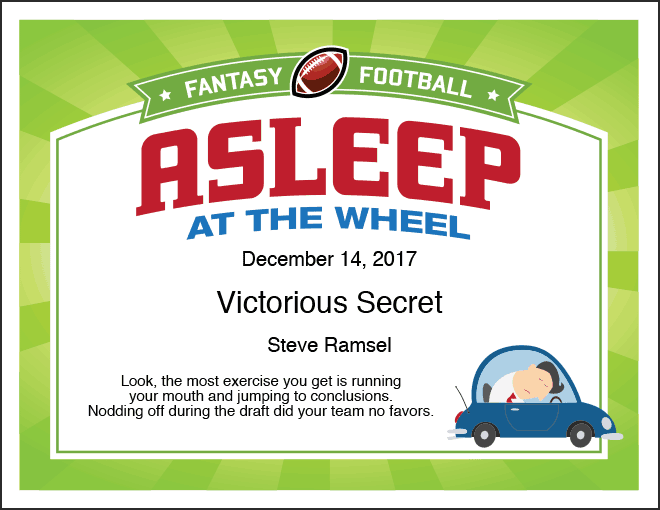 The Cranky Commissioner has a new line of 35 Fantasy Football Certificates that you can customize to your teams and owners. For $29.99, you can get them for your entire league (up to 12 teams) or buy an individual pack for one person at $19.99. The Commission and league owners can use the text fields to write in their own comments and attach them to emails or texts, post them on Facebook (take screen captures), or award them in person. 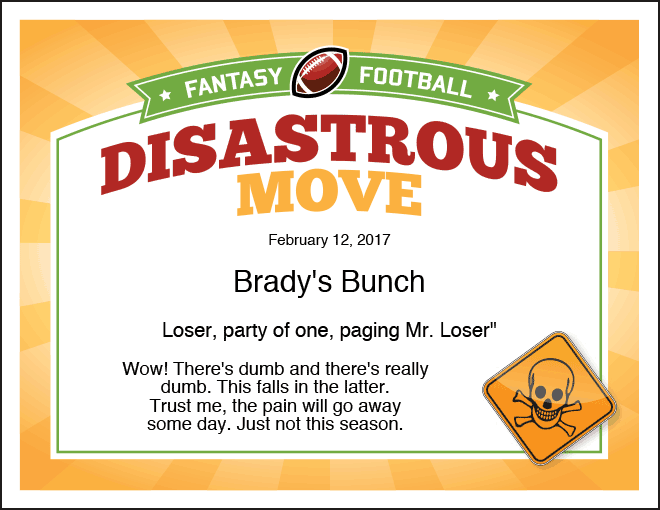 Here’s where you can find out more: Cranky Commissioner Fantasy Football Certificates. Let me show you how it can work. Let’s say you want to taunt your opponent in the upcoming week. 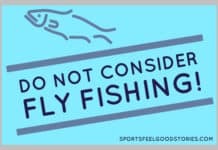 So, on Wednesday or Thursday before the tilt, you forward the following certificate. IMPORTANT: Remember you can update the text fields in black to say anything you want. Or, let’s say, you’re playing an opponent who has chosen an odd team name. How do you combat that? 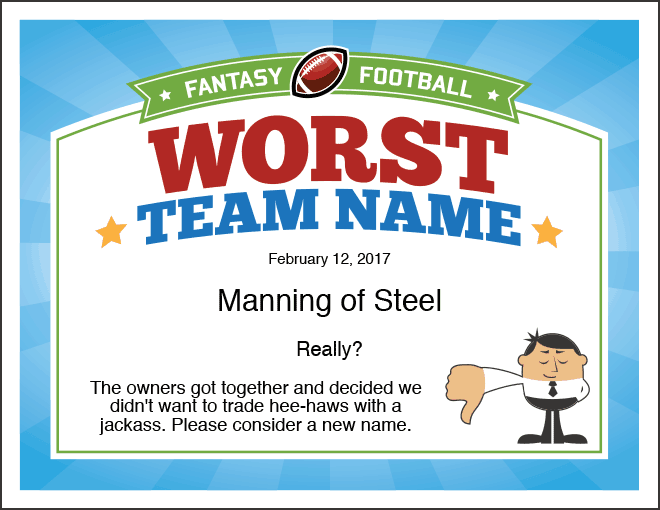 Give ’em the Worst Team Name Certificate. Or, let’s say, one of your fellow owners made a daring move. Maybe they picked up a high profile player that looks to be a bust to you. What do you do? Send them a text with a screen capture of a certificate like this. Or perhaps your chief rival blew it on a move or didn’t take action on a timely basis. By all means, let them know. Or, maybe you want to propose a trade to another team owner. The solution: A “Let’s Make a Deal” proposal. 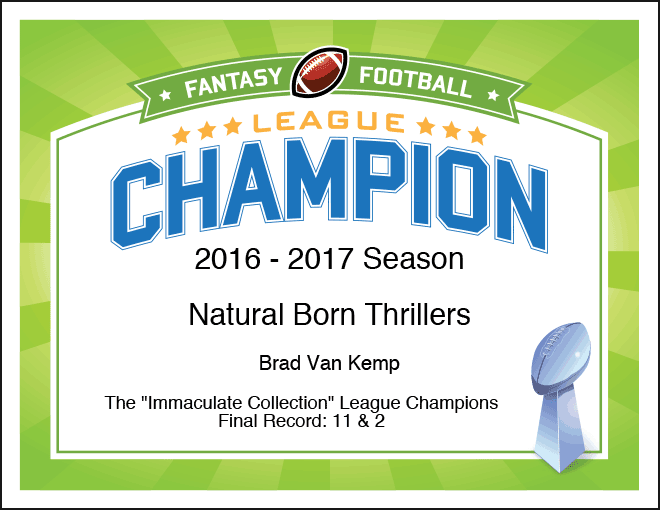 And, there’s also fantasy football certificates for your league’s commissioner. Maybe the commissioner does a regular update. 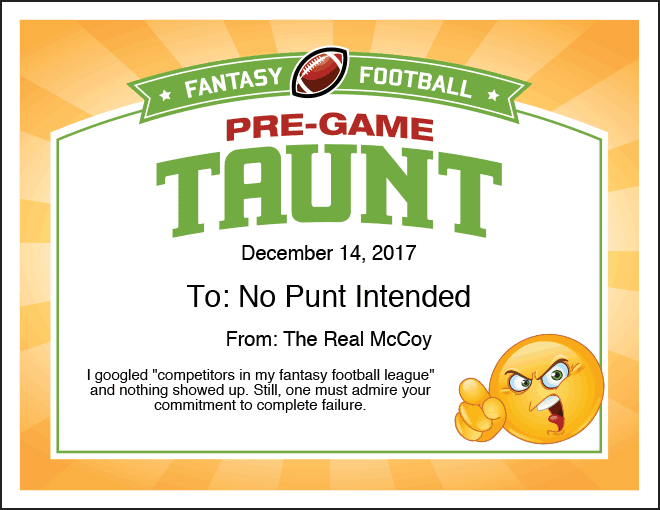 Of course, there’s a certificate for the Fantasy Football Champion. Recognize the top game of the week. And, when owners are doing something right, let them know they’re playing with their “A” game. So there you have it. 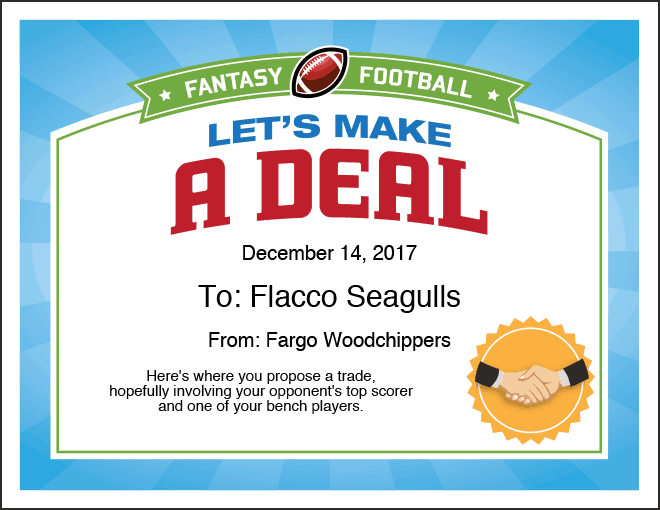 Have more fun in your fantasy football league. If you buy the multi-pack, it’s a lot of fun as certificates are swapped among various owners. 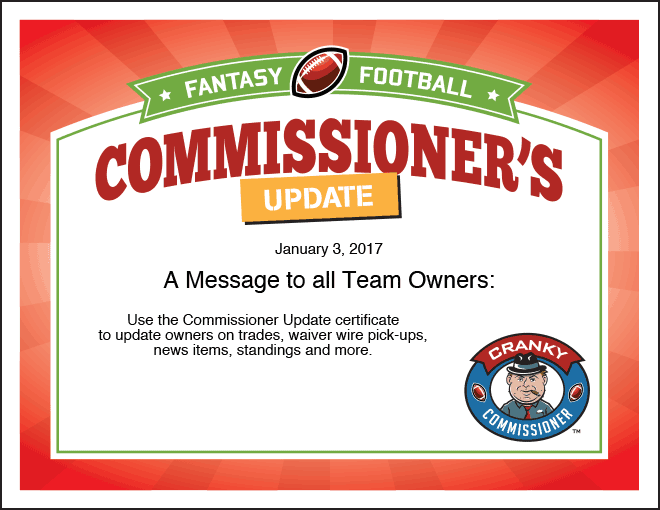 Get these certificates and the complete 35 certificate pack via the Cranky Commissioner Fantasy Football Certificates.